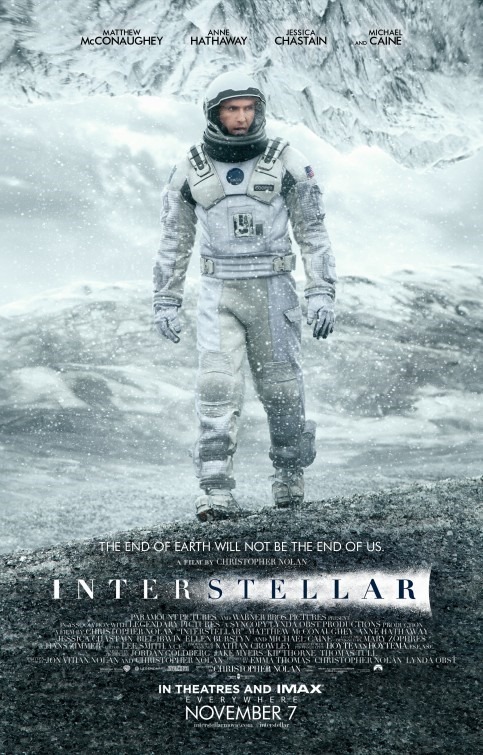 I waited an inordinately long time to see Interstellar, and I’m kind of ashamed of it. This is geek stuff! Spacey! Futurey! Black Holey! Einsteiny! It’s my bread and butter, my mother’s milk. A space movie with breathtaking space, actual characterization, solid dialogue and potentially even science? And from Christopher “Memento/Dark Knight/Inception” Nolan, even! If you had asked 2013 Puddin how long it’d take him to muster the energy to go to a midnight showing on some Saturday night after the kids were in bed, he’d have muppet flailed all over you and then bet he’d be there on the first weekend. Second, at best. This was a movie begging to be seen on the big screen, after all. But then November came and the movie released. And 2014 Puddin started reading reviews. The muppet flail trailed off, the eyebrow arched, and the roaring blaze of my determination to make time to catch Interstellar in the theater whittled down to little more than a sputtering match head. It happens, especially when a movie hits over the holidays. Which means I didn’t see it on the big screen. So I waited until it released on disc. I waited with some impatience, too, still bearing more anticipation for it than I expected. Maybe it would surprise, after all. Until, at last, last week, it hit the stores (and pay-per-view sources). Interstellar is the kind of movie you either have 2500 words for, or 25. And while all the heavens, hells, and the Lords of Kobol know I could give it 2500, I think 25 will do. Here they are: I understood what I saw in Act 3, but that doesn’t mean it made sense. I wanted a science fiction film, not a science fantasy. My disappointment aside, it’s a movie still worth seeing. I think the homages to 2001 could have been trimmed a great deal, but maybe that’s just me. I will admit, too, that Interstellar has the best few lines about parenting I’ve ever heard committed film. So, yeah, I think everyone should probably see this once. It is, after all, undeniably kind of epic. But the head-cocking “what just happened?” near the end is not the kind of epic I want to relive on Blu-Ray over and over. Outer space is the best backdrop for storytelling, I say…but this one was too long and too artsy with all the drowned out dialog. My mistake with Interstellar was that I had let my expectations get way out of hand. I was expecting something existential on the level of 2001. The movie was great, but the ending did nothing for me aside from make me groan with how predictable the whole thing turned out to be.